your Polish pottery needs in both English and Polish. History of Polish Pottery Boleslawiec (Bunzlauer) stoneware originated as folk art in the early 1800's in the German province of Silesia. The name Bunzlauer comes from the name of the then German town of Bunzlau, which is now part of Polish town of Boleslawiec. This city is located on the Bobr River in southwestern Poland near the German and Czech border. This entire region has a history of pottery making dating back to the early 7th century. Early pieces from the 1700's and 1800's were used by farmers as storage pieces and had a chocolate colored glaze. At the end of the 19th century, the potters of Bunzlauer began to introduce new lines of pottery intended for use in the parlor. Today in the small village of Boleslawiec (pronounced "Bowl-slaw-ick"), Poland, skilled artists still individually handcraft and hand paint each piece of pottery using a hand-stamping technique and free-hand design. While all ceramic factories in Boleslawiec produce beautiful pieces, the artists associated with the Ceramika Artystyczna (CA) cooperative produce an abundance of exquisite designs and pottery of the higest caliber and quality. 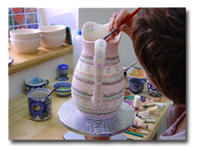 Ceramika Artystyczna has won several awards for artistic design and quality. This particular pottery is made from whiter and denser clay and incorporates more intricate designs and shapes. Many traditional and contemporary patterns are available. Zaklady Ceramiczne - is one of the oldest and largest stoneware factories in Boleslawiec. The products of Zaklady Ceramiczne are renowned for their beautiful hand-finish, original style and high practicality. At the present time, we carry only pieces from their Signature Collection, meaning each piece is crafted by a master artisan and individually signed. 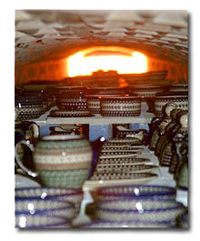 Art Pottery - a small, family-owned factory in Boleslawiec. Each piece is unique and individually signed by the artist. If you favor traditional designs and colors, you will love our collection from Art Pottery! You will be amazed by the intricate detail and high level of quality found in each and every piece. We will be adding many new shapes in the near future. Durability & Use This handmade and hand-painted pottery is fired at temperatures of 3,000 degrees Farenheit, making it not only durable but impervious to abrasives and resistant to cracks and chips. 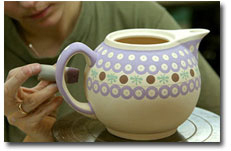 All pottery is intended for everyday use and is lead/cadmium free. The glaze allows foods to release with little or no oil. All pieces are safe for the refrigerator, oven, microwave and dishwasher. (Always allow them to come to room temperature when going from the extreme of the refrigerator/freezer to oven. Extreme temperature change will crack the pottery.